Acrylic latex paint is a better quality version of the cheap latex wallpaint. It has a different binder, it's strength can be compared to regular acrylic interior housepaints. You can recognize them by the words "100% acrylic resin" on the paintcan. They're available for both in- and exterior use. There's no latex in latex paint... "latex" indicates some synthetic binder - pva, vinyl, polyvinyl or acrylic resin. The first three are soft and elastic binders, who make the cheaper kinds of latex paint. The more acrylic resin a latex paint contains, the better quality it is. That also shows in the pricing. 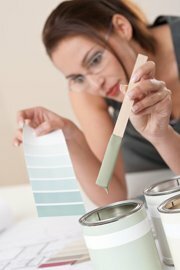 Acrylic latex paint usually has a 100% acrylic resin binder, but checking the labels does no harm. Acrylic latex paint is a pretty strong paint, available in different sheens. Exterior paints can be used anywhere, and the 'interior' paints can be used for walls and interior wood trim. If you use it for high-traffic area's, think of protecting the paint with an extra coat of polyurethane laquer, then it will be stronger. For a Flat interior acrylic-latex paint, click here. High-gloss exterior acrylic-latex paint - the high-gloss paint only comes in an 'exterior' quality, but it will do fine indoors as well. Click here for more on paint sheen . This paint can also be turned. You can also paint latex on fresh wood - but it will be matte and the wood fibres will come up, making a rough structure. If you want smoothness or shine, better do a first. For painting latex, it's best to use synthetic brushes - or bristle brushes that have soaked in water overnight. You also clean up with water. Don't dilute the paint, unless it's really too thick to work with. When you'll paint new colors, it's best to do a primer - it's likely that the new color won't hide in one layer. For acrylic latex paint, it can best be an acrylic-latex one. But when you need to paint over glossy surfaces or old paint layers of unknown source, check this page on primer paints - then you'll have to compose a different layering system. Check the old paint, by rubbing it with a cloth drenched in a little denatured alcohol. If paint comes off in any way, it's safe to use the acrylic-latex primer (if not, the old paint is oil-based). This primer can be color-matched as well (click here for products), that saves you one or two paint layers. If you use a primer, you'll have a better hiding power. If the primer actually hides in one layer, you can leave the wall as-is, or seal it with an extra (thinner) coat of acrylic latex paint, or even a clear sealing product. Which can be a latex binder, or a polyurethane for strength. Try out the binder in a hidden corner, to see if it makes the paint darker. White paint is usually cheaper than colored paints, so check the economy region of your local warehouse for that. But if you want strong paint, do look for the words "100% acrylic resin" on the label. Cheap is not always cheap - more expensive latex paints are stronger and have a better hide, which may save you money after all - by saving you a paint coat, or making your job stay good for a longer time. Soft latex paint can be painted over latex, shellac primer/sealer, and over wallpaper. If you need to paint over a glossy acrylic, use an acrylic latex primer first (scroll down). With some extra preps (shellac) you can also paint soft latex over oil based paint. Acrylic latex paint can be turned into structure paint, heat reflective paint or chalkboard paint, only by adding some dry powder additives. Click on the items and find out more.